Last week, I worked on creating a mailing list for a public facing SharePoint site. I really had some constraints because I was only allowed to use SharePoint Designer and the browser. I’m not used to these situations because I am mainly a software engineer. However, it was a very nice experience. I applied lots of knowledge and I worked around the constraints. I decided to put the experience and workarounds together into an educational series of articles to help SharePoint end users and administrators create their own mailing list without writing a single line of .NET code. A SharePoint form is needed, from which anonymous users can send requests to join the mailing list. We need this information to be stored somewhere on our SharePoint site. server-sided. Validation provided out of the box. When filling out the form, users should select their countries from a drop down list, which holds all the countries of the world. We need to first approve those requests before allowing users to receive our letters. Once a request is approved, an e-mail should be sent informing him/her of the approval of the request and telling how to unsubscribe from the mailing list. List administrators should be able to send e-mails to all the approved and registered users specifying some filters. For instance, the list administrator should be capable of sending e-mails to all the registered users from Canada. 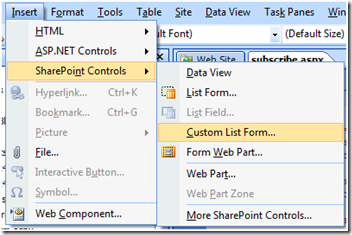 Creating and configuring SharePoint Lists using SharePoint Designer. Configuring anonymous contributions for SharePoint Lists. Creating simple SharePoint Designer workflows for sending confirmation mail to list subscribers. Configuring content approval for share point lists. 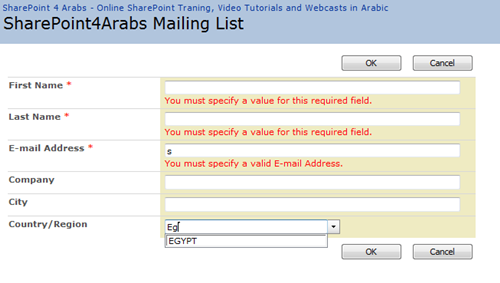 Creating custom SharePoint list forms. Creating Client-Side validation for SharePoint list forms. Using Data Form Web Part. Connecting SharePoint Lists to Outlook. Using the Word 2007 Mail Merge feature with SharePoint Lists. Using and creating SharePoint List Templates. Using lookup columns in SharePoint lists. A couple of days ago, I had troubles with anonymous access to a custom form for a custom list. I created a list, and added a DataFormWebPart to the page using SharePoint Designer as shown below. Yes! I have learned that the hard way! “SharePoint Troubleshooting” , A new free bonus issue of Understanding SharePoint Journal written by Me! Just a quick note to let you know that a new free bonus issue of “Understanding SharePoint Journal” was released a couple of hours ago. The issue is titled “SharePoint Troubleshooting” and is written by me. In that 25-page bonus issue, I will introduce you to some of the troubleshooting utilities, tools, tips, and tricks that can make your life easier in view of the fact that SharePoint troubleshooting can really be a nightmare for those who are new to the platform if it is not performed properly. The initiative for this issue came out of my late nights as a software engineer trying to troubleshoot SharePoint solutions to ship high-quality products on time.